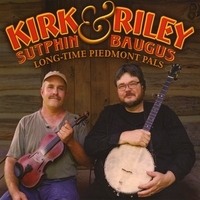 The new album is called Kirk Sutphin and Riley Baugus, Long Time Piedmont Pals. We were approached by Charlie Faurot of Old Blue Records to make the album. He is the collector that recorded Tommy Jarrell, Fred Cockerham and Oscar Jenkins back in the 60s. Those recordings sort of got the ball rolling for the “revival” of Round Peak music, which really means that it spread outside the Surry County area and was discovered by loads of people who fell in love with the sound and the idea of the living tradition. It is a collection of tunes that we have known since childhood as well as some we learned just for the recording. We included some tunes that we learned from recording of a great musician named Matt Simmons from Stokes County, NC. It is the county just to the North of us here and is often overlooked musically. “Drunkard’s Dream” and part of our version of “Wild Bill Jones” comes from Matt Simmons. It also includes a version of “Paddy On The Turnpike,” which we learned from H.O. Jenkins, the grandson of Frank Jenkins who played with Tommy Jarrell’s dad, Ben Jarrell in DaCosta Woltz’ Southern Broadcasters, in the late 1920s. We did a couple of tunes that we learned from field recordings of Fields Ward from Galax, VA and some tunes from Wade Ward, and tunes we learned from Tommy Jarrell, and others that we learned along the way from several different players. It was huge fun to make. We recorded it all live. No overdubs, or punching in. We played the tunes and recorded them. Charlie set up in Kirk’s living room in true field recorder fashion, and we did the record. We like to think of it as our field recording. It’s cool to do a record that way without all the bells and whistles that you have at your disposal in a studio. Just the instruments and the voice and the room sound and whatever editing gets done. One of my favorite ways to record. I played Banjo and Guitar on most of the recording while Kirk played Fiddle and Banjo on most of it, but we did switch around a bit too. I played Fiddle on a couple and he played Guitar and Old Time Fingerstyle Banjo on a couple. Most people tend to think that Clawhammer is “THE” old time way of playing 5 string Banjo, but Fingerstyles were just about as common in the Southern Appalachian region. As kids we always loved the things that were old, seemed old or stood for the old ways. It was like getting to be kids again to do this record. We played tunes that we actually had to learn, and we spent several days together playing tunes and telling stories and just having fun, just like when we were kids.